Ensuring the safety of personnel in the enclosed influent channels adds to the complexity of an already challenging project. Harsh environmental conditions inside wastewater treatment plants (WWTPs) can cause significant deterioration and damage to the reinforced concrete structures. In most municipalities and jurisdictions, the reality is that the existing sewer pipe network flows to only one location. There are no alternative sewage transport or treatment infrastructures available as a secondary backup in the event of the collapse or failure of a critical structural component. 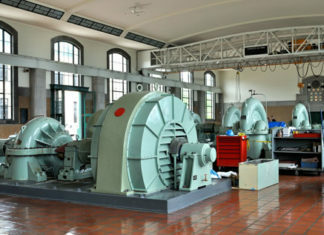 As a result, plant managers and personnel responsible for the maintenance and operation of these facilities recognize that long-term, reliable methods for the repair and protection of the concrete structures are an important investment to ensure that their plants continue to meet current treatment capacities and to accommodate expanding future needs. 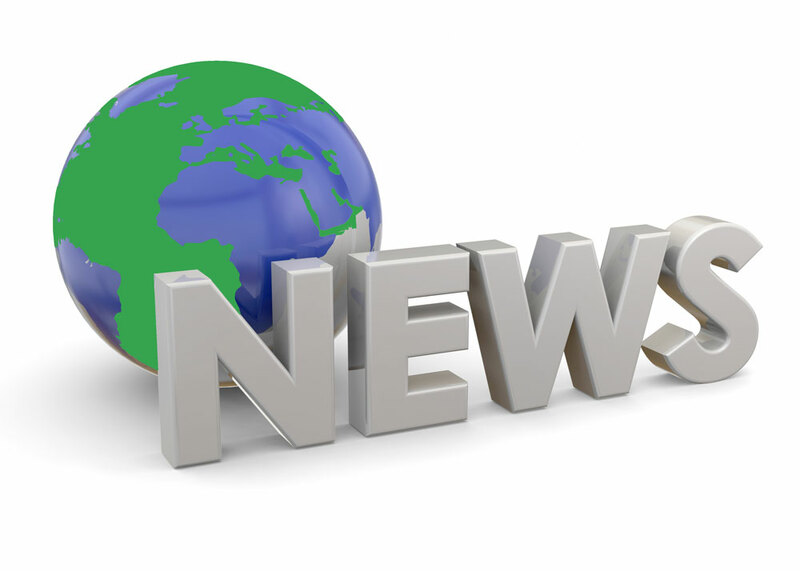 It is generally necessary that a WWTP remain in operation during maintenance or repairs. The challenge of temporarily isolating and diverting influent flow can, therefore, add to the difficulty and cost of an already complex repair scenario. Ensuring the safety of personnel accessing the hazardous environment inside the enclosed channels and tanks adds further complexity. Providing a resilient, long-term structural protection assembly can be significantly more cost-effective over the long life cycle of a plant, in comparison to lower initial cost measures that will require more frequent repairs or re-application in the future. Three influent channels are located at the Gold Bar Wastewater Treatment Plant in Edmonton, Alberta. These include the original influent channel (constructed in 1955), and Channel Nos. 2 and 3, subsequently constructed around 1979 to meet the plant’s increasing demand requirements. Influent Channel No. 2 consists of a reinforced concrete rectangular tunnel more than 90 m long, with interior widths varying from approximately 2.13 m – 3.05 m, and interior height varying from approximately 1.98 m – 3.28 m. The channel structure is entirely below grade, with 305 mm side walls, a 381 mm floor slab foundation, and a roof slab varying from 305 mm – 381 mm in thickness. Overlay reinforcement on the Influent Channel No. 2’s overflow weir. Portions of the roof structure include 305 mm wide reinforced concrete beams where the channel roof structure also forms the main floor of a process building. A partial height weir wall in a portion of the channel provides emergency overflow capacity into an adjacent diversion channel. Several expansion joints were provided along the length of the buried channel structure, and a fiberglass-lined venturi flume is located in one zone to aid in the measurement of wastewater flow rates. The channel construction includes an isolation gate and roof access hatches in localized areas. Influent channels transport raw wastewater from the plant outskirts to the grit tanks, screen chambers, and initial pre-treatment areas. Thus, they are often exposed to the harshest and most corrosive environments within a WWTP’s concrete infrastructure. Raw influent and partially treated wastewater typically contain relatively high concentrations of hydrogen sulfide (H2S) gas, which forms sulfuric acid when in the presence of moisture, oxygen and bacteria. The sulfuric acid then attacks the concrete, exposing the concrete matrix and underlying aggregate, and eventually the embedded reinforcing steel. 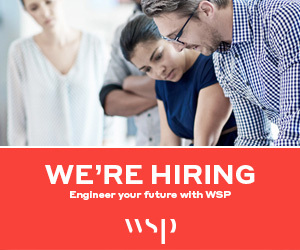 Typically, concrete deterioration due to H2S environmental exposure has been observed to be most severe within the enclosed portions of WWTP structures, such as buried channels, and covered grit and clarifier tanks. This deterioration is generally concentrated in the zone between the water level and the underside of the roof enclosure above. Rates of concrete deterioration and microbial corrosion vary, depending on the concentrations of sulfides in the wastewater, flow rate and level of turbulence, and the subsequent rate of H2S release. Hydraulic conditions that result in splashing, misting, or flow constrictions often result in an increased amount of H2S gas being released from the wastewater. During an interior inspection of Influent Channel No. 2 in 2014, after approximately 35 years of service and H2S exposure, between 32 mm – 76 mm of deteriorated and unsound concrete was identified on many interior surfaces during hammer-sounding of the channel walls, columns and roof members. The extent of deterioration varied from the roof to the low water level, up to the full interior height of the channel walls in some locations. Significant erosion and loss of concrete wall thickness had occurred in many locations, often to the depth of the reinforcing steel. Similarly, the concrete cover on the underside of the roof slabs had deteriorated and exposed the lower mat of reinforcing steel in many locations. Beam stirrups and bottom layer reinforcement steel were also exposed and heavily corroded, with visible loss of cross-sectional area. Influent Channel No. 2’s original construction details showed approximately 38 mm – 51 mm of concrete cover over the embedded steel reinforcing steel. Therefore, the severe extent of concrete cover loss, the resulting reduction in concrete member thickness, and loss of reinforcing steel cross-sectional area were considered to be of structural concern in the affected areas. This caused a significant reduction in load-carrying capacity. In addition to the structural concrete deterioration, the inspection revealed that expansion joint seals were missing or damaged, and thus no longer effective. Metal gratings and handrails were severely corroded above the wastewater flow level. Repair and restore deteriorated and damaged portions of the concrete influent channel structure, to achieve the load-carrying capacities required in the original design. Provide increased structural strength in localized areas, where necessary, to meet current loading and usage requirements at the facility. Incorporate enhancements, where cost-effective, to improve the overall structural durability and to minimize the vulnerability of smaller-dimension structural members, such as beams and columns, to sulfuric acid attack and cross-sectional loss. Incorporate a protective coating or liner assembly to provide long-term protection for the concrete channel structure against the harsh environmental H2S exposure and resulting sulfuric acid attack. 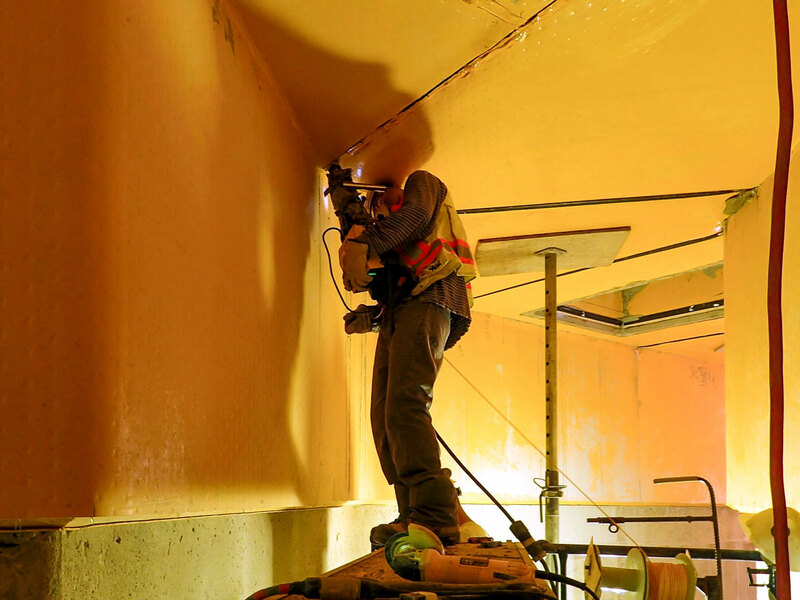 As a project criterion, the plant maintenance team identified that the protective measures must minimize the need for future re-coating, re-application or repair requirements. Improve the degree of leakage resistance and protection of the expansion joint assemblies to H2S attack, impact from submerged debris, and cleaning operations. Maximize the remaining service life of the concrete infrastructure. Based upon the identified project criteria and objectives, a structural repair and protection program was developed and undertaken in 2015 that included the following measures. Channel debris and deteriorated and unsound concrete was removed. The substrate surface was then cleaned and prepared to a CSP 5 concrete surface profile, in accordance with ICRI Guideline 310.2R, prior to the placement of new reinforcement and concrete overlay materials. A cast-in-place, bonded, reinforced concrete overlay was installed to the affected portions of the channel’s interior roof and wall surfaces. A minimum overlay thickness of 114 mm was provided at the underside of roof slabs, and to designated portions of sidewall surfaces, to no less than 406 mm below the lowest water level. In much of the channel length, the entire wall height was covered with the new overlay system to improve constructability and detailing. The overlay thickness was designed to provide the 51 mm concrete cover required by ACI 350, plus provide sufficient depth for installation of hooked steel dowels and reinforcing bars. A highly durable, sulfate resistant, self-consolidating concrete mix was specified to provide the low shrinkage, low permeability, pumpable concrete necessary for the overlay construction and subsequent environmental exposure. The relatively thin roof beams were eliminated, and additional reinforcement incorporated into the overlay thickness at those locations. Elimination of the beams reduced trapped pockets of H2S gases occurring at the underside of the roof slab between the underhanging beams, and eliminated the inherent vulnerability of the small beam members to sulfuric acid attack. Field welding of the HDPE liner was done with an extruded welding rod of the same HDPE material. A proprietary high density polyethylene (HDPE) protective liner assembly was cast into the surface of the new concrete overlays. Although originally intended for new construction, the protective liner material was identified as having suitable rehabilitation capabilities, a service life significantly in excess of that provided by typical surface applied-coating materials for the H2S exposure, and the acid and microbial attack typical inside WWTP influent channels. The protective liner consists of a 3 mm thickness of HDPE with integral rows of 13 mm anchor studs that provide mechanical interlock and bond to the concrete substrate. The smooth exterior surface of the liner provides improved flow rates for the wastewater influent, compensating for the reduction in hydraulic flow capacity due to the thickness of the new concrete overlay. Expansion joints were replaced with a multi-layer assembly, consisting of a compressible closed-cell foam backer adhered within the joint gap, a flexible sealant, and a watertight polyolefin gland adhered to the substrate. To protect the expansion joint assembly against damage, a neoprene gasket and proprietary rubber-encapsulated metal cover plate assembly was provided at areas that were vulnerable to impact from stones and debris. 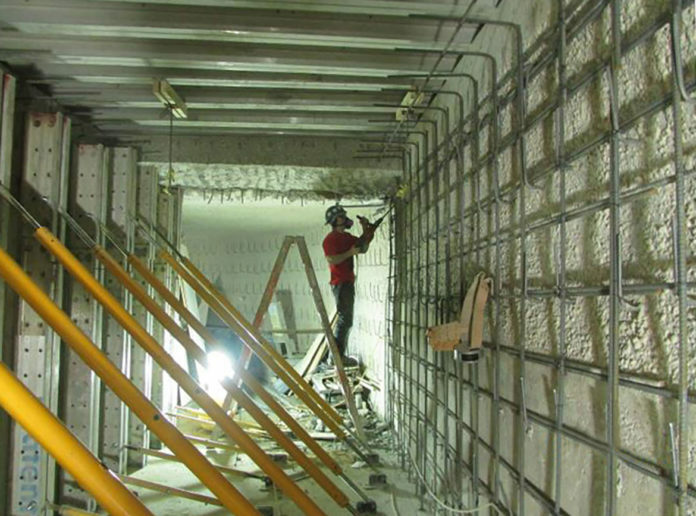 In accordance with plant requirements, only materials and components that met the requirements of ACI 350 and NSF/ANSI Standard 61, suitable for potable water contact and submerged exposure, were used in the construction of the structural repair and protective measures for the project. The structural design of the new concrete overlays was intended to provide fully composite behaviour between the undamaged portions of the existing structure and the new concrete overlay, through material bonding and sufficient reinforcement dowelling at the shear interface. The recently-developed ACI 562-13 Repair Code Requirements provided valuable guidance for the design, bond interaction, and required transfer of forces between the existing concrete channel and the repair overlay system. Other considerations and requirements for design of the concrete overlays in this application were identified in ACI 350, including concrete cover, reinforcement ratio, and spacing requirements. Integration of the new HDPE protective liner into the outer surface of the concrete overlay provided some design challenges. Although manufacturer’s recommendations and guidelines were available for typical splices, corners and transitions, it was necessary to develop details for many of the project-specific requirements. Details for HDPE liner transitions into the existing fiberglass venturi flumes, the new stainless steel expansion joint nosings, the piping and process equipment penetrations, and other non-typical locations were developed and refined in a collaborative basis between the engineers and contractor, throughout the design and construction phases of the project. Construction of the bonded overlay and HDPE protective liner assembly also provided some challenges for the contractor. 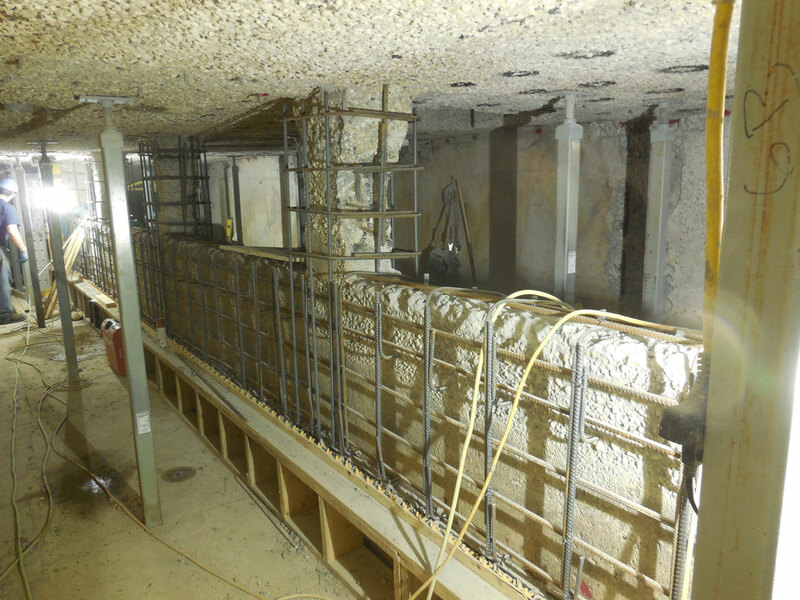 It was necessary to ensure that formwork and bracing systems introduced the fewest possible number of penetrations through the protective liner, to minimize liner patching requirements before returning the channel back into service. Additionally, the lack of formwork tiebacks into the concrete substrate also introduced the challenge of ensuring that the layer of HDPE liner did not wrinkle or warp during placement of the self-consolidating concrete overlay materials. The HDPE liner is produced in long rolls, which requires that all edges be field-welded to provide the final water-tight assembly after removal of the construction formwork materials. Field welding was performed using an extruded welding rod of the same HDPE material along the length of the liner’s prepared edge joints. High voltage spark testing was performed along all field welds to ensure that a watertight liner assembly was provided. In addition to the spark testing and visual inspections of the installed protective liner, testing requirements for the project included daily tensile testing of welded liner splice samples, plus tension and shear pull-testing of representative samples of the installed hooked reinforcement dowels. The repair and protection of concrete infrastructure in harsh environmental exposures can pose challenges for the required restoration techniques and protection measures. However, through appropriate pre-assessment of the existing infrastructure and an understanding of the exposure conditions and facility usage requirements, it is possible to successfully adapt and advance established concrete rehabilitation and protection principles in order to maximize the longevity and resiliency of existing WWTP concrete structures. In an existing wastewater influent channel, with significant deterioration and loss of concrete thickness at the roof and wall members, the construction of a new bonded concrete overlay with integral HDPE protective liner assembly was successfully achieved. This restored and enhanced the channel’s load-carrying capacity, and provided appropriate long-term protection against harsh environmental exposures in the future. Daryl Prefontaine, P.Eng, is a Principal at RJC Engineers. This article appears in ES&E Magazine’s August 2018 issue.